Royal Canin Canine Satiety Support is a low calorie food that keeps dogs feeling full for longer. Developed by Royal Canin's team of vets and nutritionists, this dog food is specially formulated for pets who need to lose weight. The food is high in fibre to keep your dog feeling satisfied and full for a longer time after eating. This reduces the chance of them overeating and therefore putting on weight. The food also contains ingredients that can help maintain joint and bone health as, due to their size, overweight dogs are more likely to develop problems in these areas. The calorie content is low, so your dog should lose weight even if they aren't exercising often. To combat the low calorie content the food is enriched with extra vitamins and minerals so that your dog will have all the nutrition they need to be healthy, active and happy. Finally, the recipe is high in protein: this helps satisfy hunger and also helps your dog to keep their lean muscle during the weight-loss regime. nutritionally complete and intended to be your dog's only food source. Obesity in dogs can lead to other health problems including diabetes, joint and bone pain and a shorter lifespan. Your vet can do a proper analysis and tell you if your dog is overweight, but a quick test you can do at home is looking at them from above: they should have a clearly defined waist. Their ribs generally should not be visible (that's often a sign of them being underweight) but you should normally be able to feel them when you stroke your dog's sides gently. If you can't, it could be a sign that your pet needs to go on a diet. While the most common causes of weight gain is eating too much and exercising too little, it can also be a side-effect of more serious problems such as Cushing's disease, pancreatic cancer and hyperthyroidism. It's important to visit your vet to rule these out. In addition to putting them on a stricter diet, you can also help your dog to lose weight by encouraging them to exercise more: for example, by taking a ball out on walks and getting them to run after it. Because veterinary diets are formulated for the nutritional support of pets with specific clinical conditions, we recommend that you only use them under professional advice. 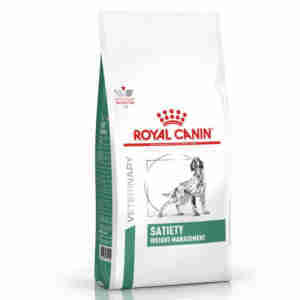 For more information on feeding Royal Canin Canine Satiety Support to your dog, please consult your veterinary surgeon. Vegetable fibres, dehydrated poultry meat, wheat gluten*, tapioca, maize gluten, hydrolysed animal proteins, maize, wheat, animal fats, beet pulp, minerals, fish oil, fructo-oligo-saccharides, soya oil, psyllium husks and seeds, hydrolysed crustaceans (source of glucosamine), marigold extract (source of lutein), hydrolysed cartilage (source of chondroitin). Vitamin A: 13900 IU, Vitamin D3: 700 IU, E1 (Iron): 32 mg, E2 (Iodine): 2.5 mg, E4 (Copper): 6 mg, E5 (Manganese): 42 mg, E6 (Zinc): 139 mg, E8 (Selenium): 0.05 mg - Preservatives - Antioxidants. Protein: 30% - Fat content: 9.5% - Crude ash: 5.7% - Crude fibres: 16.5% - Metabolisable energy: 2866 kcal/kg (NRC85). *L.I.P. : protein selected for its very high assimilation. Meat and animal derivatives, cereals, derivatives of vegetable origin, minerals, oils and fats, molluscs and crustaceans. Vitamin D3: 140 IU, E1 (Iron): 5 mg, E2 (Iodine): 0.2 mg, E4 (Copper): 1.9 mg, E5 (Manganese): 1.7 mg, E6 (Zinc): 17 mg. Protein: 8.5% - Fat content: 2% - Crude ash: 1.5% - Crude fibres: 2% - Moisture: 83% - Metabolisable energy: 602 kcal/kg. Suggested by our vet several years ago as our now senior whippet put on a lot of weight due to being "done". We find that other foods do not fill him up and leave him hungry and so we'll be buying this for the duration.